The power of education is huge in all walks of life. It may sound obvious, but learning how to build a house, of any kind but especially a straw bale house, is a good thing to do before you actually start building. Okay, it sounds REALLY obvious; however, you may be amazed at the number of people who approach the construction of their house from the”how hard can it be?” perspective. Please don’t be that person. The reality is that building a house is very hard. There are physical aspects to consider; technical skills to learn; managerial positions to fill; and emotional impacts on your personal life to balance. If you understand this and have some hands-on experience with all aspects of the job in advance of starting your own project, you will be in a good position to succeed. There are a lot of ways to gain experience too, so pick one that fits your learning style. For example, you can read books, watch straw bale construction DVDs, or participate in a hands-on workshop. You might also look outside the bale-specific learning environment and consider volunteering for Habitat for Humanity in order to gain some framing skills. 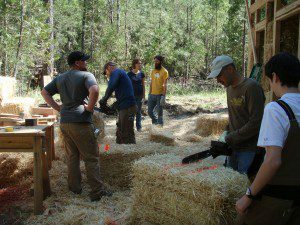 Although not specific to straw bale construction, you will learn good framing skills AND contribute to a positive cause. No matter what course of action you take, the key is just to be sure to take action. Going into a project with some hands-on experience will make all the difference in the world. Ask yourself the following questions and if you cannot answer them with a high level of confidence, you would be best served to gain some more experience before you start building. In fact, you are probably best served gaining that experience before you start designing your home so that you know what you are “getting yourself into” when it comes to the design of your house. In other words, you will want to know if it will be a realistic build or if you are setting yourself up for failure due to the size, scope, and details of the design. Here’s your test. This is just a few of the myriad of questions you should be able to answer with ease before building your own house. If you don’t do well on the test, your best bet is to click this link to sign up for a workshop today (yes, that is shameless marketing, but it is true). When laying out wall framing for interior walls on 16″ centers, what is the first measurement you pull from the end of the wall and why? What staple pattern is required on welded wire mesh to ensure proper strength for a non-shear-resistant installation? How many courses of bales can you stack before needing to install a bale stop so that the wall remains tight and strong? Is it a good idea to spray your straw bale walls with water before you plaster? Why or why not? How do you attach electrical boxes to straw bale walls so that they are secure and pass inspection? What size nails are required for roof sheathing installations and what is the specified nailing pattern across each sheet? What is the best way to notch a straw bale so that the notch is clean and evenly shaped? How do you quickly and effectively retie a straw bale when making a custom sized bale? How do you keep your job on track financially and in terms of schedule? If a bale is out of plane in an exterior corner (i.e. it is sticking out too far), how do you fix that problem since the bale cannot be pushed in any farther due to the intersecting wall? How do you manage a job site effectively. List three important steps to success. If you plan to install acid stained concreted floors, what three steps will ensure a beautiful finish? Hint: they are not included in the instructions of most acid staining materials. How long must you wait in between coats of plaster to ensure a quality job? How often must the mesh be tied to the bales and with what knot? What is the minium size window for a legal bedroom “egress rated” window? When everything goes wrong with your build, what one action can you take to keep things together emotionally and on the job site? Thank you for the questions, by the way. They’re a good reminder that I need to keep studying. Great questions, and a good place to start if you have not learned much yet. If you have, a good way to mark your path toward readiness. Thank you. Even though I grew up on construction sites ( 3rd generation carpenter/general contractor) I couldn’t answer all of these. I am looking forward to attending some workshops.